Believe the redacted term is not “pattern analysis”. There is no need to redact that term if you allow “analytic tradecraft” in the description of what domestic identities are allowed to be queried. Believe it’s a specific type of selector (i.e. it’s “______ selector” that’s different from a “seed selector.” Many possible adjectives come to mind, “synthetic,” “algorithmic,” “signature,” “generated,” etc., or that it’s “generated _____.” Or it’s another word of the same type, say, “filter,” located in either slot (e.g. “contact chaining filter generation” or “contact chaining generated filters”). E.g. if they wanted to limit contact chaining queries to the seed selectors instead of allowing an adaptive selector to change as it went through the contacts, or to allow generation of more alert list entries, then it would be something like any of these. The difference between allowing only searches on definition fitting seeds and allowing searches that do an adaptive meander or add entries to the searchable list is a big one, and not beyond the reach of imagination of an organization that specializes in hiring hackers. 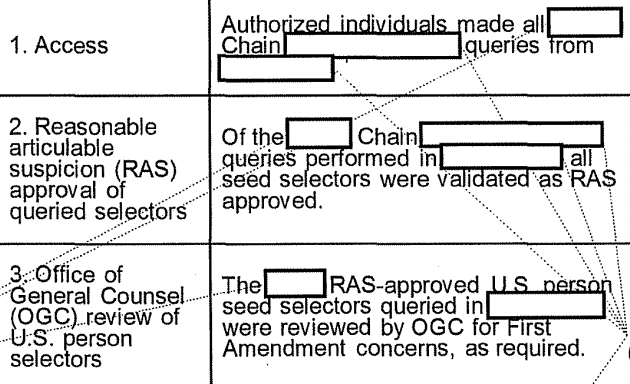 The other redactions (e.g. in front of “analyst”) work, I think, if you put in “XKeyScore” or some other classified name for them. Just speculations, but they didn’t classify something that equates to “pattern analysis” elsewhere. 1) this was redacted at a time when the IC was affirmatively denying they were doing pattern analysis, by name. So while analytic tradecraft is more sensitive (except insofar as they dishonestly claim that the people thus exposed must have ties to terrorism), it’s not something that fit into both the legal and legislative strategy of the IC when redacting. 2) keep in mind the audience level here. You’ve complained, in the past, abt the use of the word “database” rather than repository. Yet this discussion includes such language (it’s just one example of how I responded to your complaint about it). The IC frankly never provided the FISC the detail they really should have, and therefore the vocabulary is likely to be simplistic. 1) I’m not complaining. I like your article. 2) I think the document makes a distinction between a seed selector and contact chaining “_______________” (queries). So that was the basis of my comment. Interesting article! The database storing the BR FISA transactions is probably MAINWAY, which was described in the IG’s STELLARWIND report as “NSA’s primary tool for conducting metadata analysis”, not only for telephone, but also for internet metadata (which indicates they could link together both types of metadata). MAINWAY would also fit the redacted spaces in the excerpts you show (in the excerpt after “(336)” when not fully written in capitals). Like data through the hourglass.. Our lives..